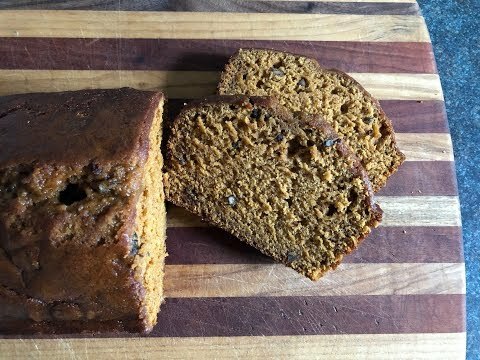 Pumpkin bread is great for sandwiches, or on it's own. Subscribe: Snapchat: @yousuckatcookin To make pumpkin bread, heat the undo to 350. Sift this stuff together in a bowl: 3 1/2 Cups all-purpose flour 2 Teaspoons baking soda 1 Teaspoons baking powder ⅔ teaspoon table salt 2 Teaspoons pumpkin pie spice Combine this stuff with a hand mixer: 3/4 cup unsalted butter, softened 2 ½ cups Brown sugar Then electro-wangjangle this stuff into that stuff (meaning the butter and sugar) until it's one big bowl of glob sauce. 4 large eggs 1 15- Ounce can pumpkin (not pumpkin pie filling) ½ cup water Then add the dry ingredients slowly and rewang the jang out of it until it's one smooth glob and get 1 cup of chopped walnuts in there. Spray two loaf pans with non stick spray then pour the batter between them. Bake them for an hour. Check them with a tooth pick. If there's not much stuff sticking to the toothpick, you're good. Slide them out after a few minutes and let them cool for an hour or two. Then eat them.